Christmas is still more than a month away but festive attractions are already lighting up the city. K11 Art Mall has unveiled a 6.5m polar bear-shaped metal structure, equipped with UV lights, to highlight its artistic flair this Christmas, with Harbour City releasing its “Let’s Celebrate #HCxmas” campaign. K11’s “Art, People, Nature” exhibition was created by Beijing-based design duo Fake Studio. The glow-in-the-dark sculpture, also the iconic victim of global climate change on the arctic, stands beside two “iceberg” platforms which will light up when visitors step on to make a pledge to help save the planet. The installation is backed by artificial snow effects and festival messages that will flash across the TV wall at the piazza. “We commissioned Polar Power because we wanted to use art as a vehicle during the heart-warming holiday season to raise awareness of our impact on nature. Our hope is to transform Christmas into a time not only for sharing with friends and family, but also for thinking about how we can help protect nature,” said Adrian Cheng, chairman of K11 Art Foundation. 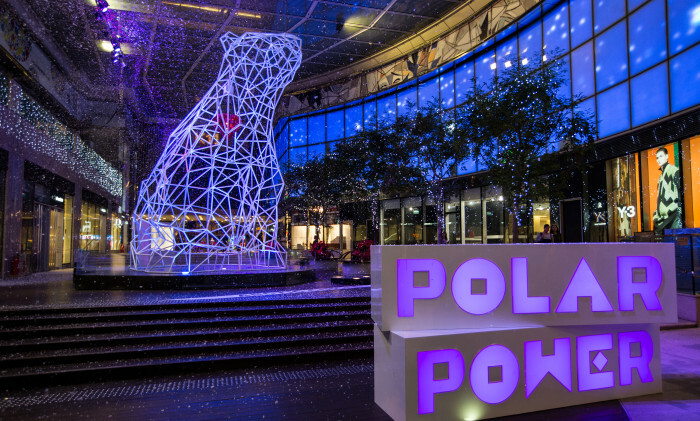 The installation is part of the mall’s festival campaign “Polar Power Love Our Planet”, which also include an exhibition of rare arctic photographs and footage, a show of eco-themed works as well as free art and design workshops set to open to the public until early January. Instead of advertising, social media will be the main channel to promote the campaign as “soft-sell approach is more convincing”, according to Rebecca Woo, Art Mall-in-charge Hong Kong of K11 Concept Limited. “We don’t do advertising much. Hard-sell advertising has given way to soft-sell tactics as consumer tend to trust what media tell them nowadays more than what operates sell them,” said Woo, adding that promoting on social media with soft-sell tactic such as interactive activities is a more convincing and effective way to cope with the shifting trend.